The Future of Salon Enhancements is Here ! Lighter. Stronger. Easier! Introducing the lightest, most natural feeling nail enhancement ever, Gelish PolyGel™. PolyGel delivers strong, flexible, feather light nails that you can count on. PolyGel is a breakthrough nail enhancement that can be applied as an overlay or used to sculpt a full set of nails. It is 23% lighter than acrylics and 16% lighter than traditional hard gels creating the most natural feeling nails with no sacrifice to durability. Supreme adhesion means no lifting or separation during wear. PolyGel is an all-in-one formula created with the perfect working consistency. There are no monomers, no mixing, and no ratios needed. The premixed formula only needs to be smoothed and guided into place with a brush moistened with a PolyGel Slip Solution Liquid. PolyGel application is a breeze compared to the enhancements of old. In three unbelievably easy steps you nail tech can pick up their product, smooth it into place, and cure in an LED light. Available in the perfect spectrum of opaque and sheer shades for creating flawless nails. Convenient squeeze tubes take the guesswork out of application. PolyGel doesn’t move until you apply pressure and stays put until cured. 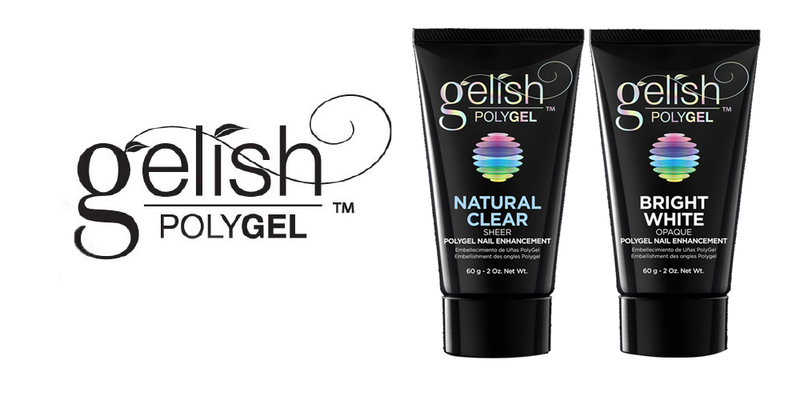 “The future has arrived with Gelish PolyGel,” says Danny Haile, CEO and Founder of Gelish Soak-Off Gel Polish. This system is “completely different … light years better” than anything on the market today! Foolproof and Flawless – suited for everyone from students to experienced professionals. Get your hands, and nails, on Gelish PolyGel!